April 11th, 1912. RMS Titanic approaches Queenstown, Ireland to make a one-hour call where passengers will board. On the evening before she had been anchored a mile offshore Cherbourg, France, collecting passengers from tenders specifically designed for offshore boarding. All are eager to experience the grandest and most illustrious transport of their time as Titanic prepares to embark on her historic maiden voyage west. 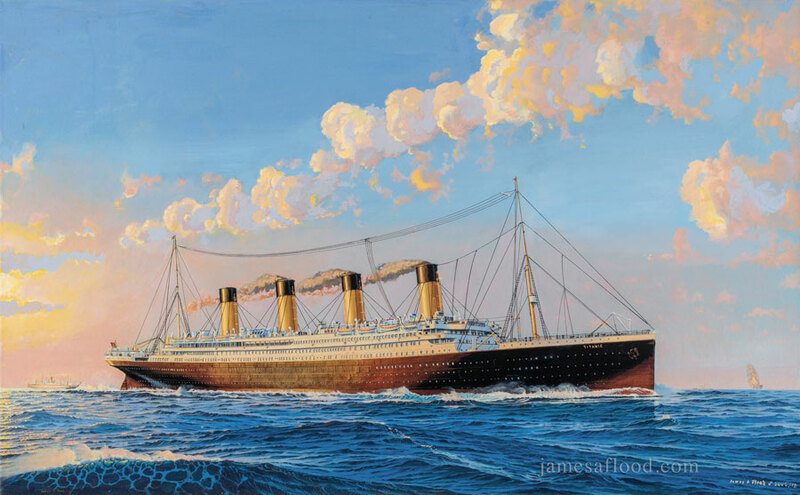 In this painting, RMS Titanic is portrayed performing maneuvers at sea in the early morning before arriving at Queenstown. This painting has been revised from the original in that the artist painted acrylic over a digital reproduction on canvas to revise the clouds and sea, and make improvements on the ship.